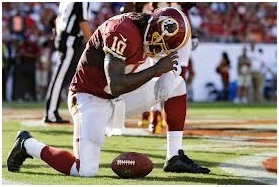 Robert Griffin III is a tough dude….no doubt about it. He is also determined and headstrong. He managed to override concern from his coaches and fellow players and talk himself back into the NFC Wild Card game when he should have sat down at let his backup go in and win the game for the Red Skins. Griffin stayed in the game, Washington was eliminated from the playoffs and 3 days later RGIII had to be operated on for a very serious knee injury that he aggravated by staying in the game when the whole world could see that he was hurt. Well, maybe not the whole world….Red Skins head coach Mike Shanahan must have noticed but somehow rationalized leaving Griffin in the game anyway. What was he thinking? Now accusations are flying around as to “who said what to who” etc. but it is beyond obvious that an error was made and now it is being reported that the talented rookie quarterback may not be able to perform at the same level as he did before the Seahawks game last week. Why was that allowed to happen? Dr. Neal S. ElAttrache is a famous Sports Medicine Surgeon based in Los Angeles. He is the team physician for the LA Dodgers and an orthopaedic consultant to the Anaheim Mighty Ducks, the Lt. Louis Rams, the LA Lakers, LA Kings and the PGA Tour. He has been listed among the “Best Doctors in America” since 2006. Dr. ElAttrache specializes in shoulders, elbows & knees. This “Doc” is a recognized expert what he had to say in a recent interview is unsettling to say the least. ElAttrache said, “I don’t know that the longevity that he would have would be what you’d want to center your franchise around”. That must have been great news to the Red Skins owner who has put up millions of dollars to make RGIII just that, a franchise quarterback. Now what? “I think that you’ll see a mobile, pro style quarterback rather than a run first type of quarterback” ElAttrache also stated. Dr. James Andrew performed a triple procedure 3 days after the injury that included the repair of his LCL, a revision reconstruction of his ACL and a repair of is medial meniscus. Any one of these operations is significant when done alone. When done together, they comprise a major surgery that leads to an extremely painful and arduous recovery. Way to go coach!